My favorite is S. I think it has the most complex plot and the best balance of filler-in and plot episodes. S has my favorite villains and of course the Outers who I love so much. While the ending to S may have some writing problems, I feel like the emotional high of the finale is all still there and overall fairly satisfying. I like Classic best, mostly because it gives us Usagi's brief time as a solo superheroine. Super is great, but I think it's a tad over-hyped. "Dreams are hopeless aspirations in hopes of coming true, believe in yourself, the rest is up to me and you"
July is Chibi Chibi Month! I pick classic, the second one that ties its R.Since we can't choose both I choose classic. Mine just goes in order. Classic at top with Stars at bottom. 3. S- I liked the Outers a lot. Dr.Tomoe was one of my favorite villains. Mimette was the last lackey I vaguely cared about. The story was interesting if nothing original but was bogged by the dissonance between the dark premise and the stupid monster designs. Though actually R and Stars are tied and it depends on my mood which one I like more. Positions on this list are subject to change based on when you ask. 2. Classic - Nearly everything I love about Sailor Moon, happens here. Rainbow Crystal arc is my second favorite arc. 3. SuperS - Not great, but not nearly as horrible as it is made out to be. Credit is given towards harking back to characters and plot developments in the first two seasons. 4. 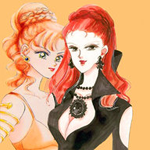 S - The only good things we got out of this were Sailor Saturn, Dr. Tomoe, Sailor Chibi-Moon, and a canonical Sailor Uranus and Sailor Neptune (don't care for the characters themselves, but that we did get something is better than nothing). 5. Stars - I hate the idea of Sailor Guardians outside of our solar system with a passion. I pretty much agree with this. Also this doesn't impact the Japanese version but I feel after the Doom Tree arc the Canadian dub for R was a bit less....polished. Part of that is the large gap between Sibling Rivalry and Rubeus evens the Score and the problems that arose from I dunno the one writer for the lost episodes having memory problems? but even just the syndicated episodes had their issues. This is a difficult question for me because my personal favorites are not necessarily the seasons that I feel are the "best" seasons. Personally, SuperS and Sailor Stars are tied at #1 for me in terms of favorites, with S in 2nd, and R and Classic tied for 3rd. I have a lot of nostalgia for Sailor Stars, and I love the general appeal of SuperS overall. The show feels more mature in Sailor Stars and I really enjoy characters like Kakyuu, the Starlights, Galaxia, the Anima-Mates, and Chibi Chibi. The whole thing feels cool and mythical to me. SuperS, meanwhile, has some of the best filler episodes in Sailor Moon contrasted with entertaining villains and a general creepiness that I enjoy. In terms of which season is actually the best, though, I do think that S is the "best" because it has the most consistent story, engaging villains, a great cast, the Outers, a complete plot...basically, it's a stronger season than both SuperS and Sailor Stars, but I can't say I love it more than the latter two seasons. I think Classic is the worst season, with R being only slightly better. I just feel like not much happens in either show. Sailor Moon's initial uniform is my least favorite of her looks (I much prefer Eternal Sailor Moon followed by Super Sailor Moon) and the plot of Classic kinda bores me, though at the same time it has some of my favorite episodes in the entire series, I know that's a weird dichotomy but it's true. R has the break-up arc which I can't stand, along with some pretty bland villains IMO and Chibi Usa at her worst (she's much better in S and SuperS). The Makaiju arc at the beginning doesn't do anything for me personally. But at least the Black Moon arc in R is more interesting than anything Classic was doing. Mamoru getting brainwashed was a huge bore for me and I don't like the Rainbow Crystal arc. In general, the first arc of Sailor Moon is always my least favorite in almost every single adaptation, with the exception of PGSM because I feel like it was actually done well there (and it was the only arc adapted...lol). So basically, for me personally: S is the best but SuperS and Sailor Stars are my real favorites despite being not as good; Classic is the worst and R isn't much better. But I love them all so being at the bottom isn't exactly a bad thing. 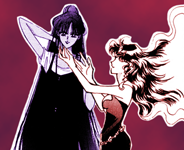 Wanna watch the live-action Sailor Moon show (PGSM) with the forum? Check out the 2018-2019 PGSM Community Re-Watch thread! R - Love the Makai Tree arc, the whole thing with Sailor Moon's future was a fascinating flipside to the 1st season revealing her past. S - The Star Trek II of the series, Outers rocked and added a sense of conflict, all-around awesomeness, only hate how Telulu and Viluy got one episode each. SuperS - Underrated, but it's still give and take. Loved the art direction and evil circus theme, the plot surrounding dream mirrors was subtly sinister, loved the humor, but the lack of the Outers and the status quo not getting shaken up as much as in the original season hindered its potential. Stars - Weird for me. By then it was getting clear the series was getting long in the tooth, yet at the same time I was exciting going through it knowing I was in for the big finale.